Patients with Obstructive Sleep Apnea are at a significantly higher risk for developing hypertension, diabetes, heart disease, obesity and sudden death. Home sleep testing allows patients to be tested with ease in their own homes. SleepView is the smallest and lightest home sleep testing monitor meeting AASM recommended guidelines. The 8 – channel SleepView is ergonomically designed for patients to perform an easy home sleep test. 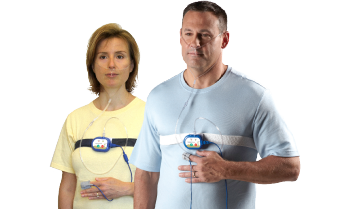 Reimbursement Friendly Home sleep testing is covered by most insurance providers. 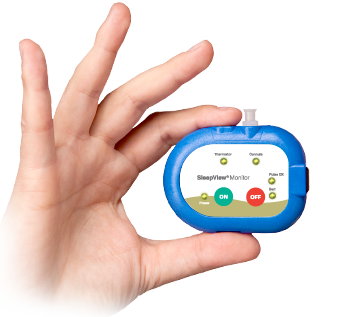 Ultra-Compact Smallest, lightest, Type III home sleep testing monitor meeting AASM recommended channel set. Sensor Check lights to indicate proper sensor connection during home sleep testing. Smart Check validates quality of recorded home sleep study before SleepView is returned to the lab. SleepView can perform multi-night studies. Scoring + Reporting Software View and score raw data using full PSG capable software. Customizable reporting. Easy patient record management. Web Portal Option SleepView's HIPAA compliant Web Portal option allows seamless, secure access to patient's home sleep test data, scoring and interpretation.